Today I thought, why not put 3 of my favorite Summer ingredients on one plate! And it’s a match made in heaven! I found the peaches at my local farmers market and the rest of the ingredients came from my garden. For a dressing I used a nice aged balsamic my sister got me in Italy and avocado oil. Yep, they make such a thing and it’s heavenly. It’s rich and buttery with just the teensiest taste of avocado. Perfect for a Summer salad like this! You can find avocado oil in markets like Whole Foods, but if you can’t find it, olive oil will work just fine. My favorite brand is Bellavado! It’s not diluted like some brands are. 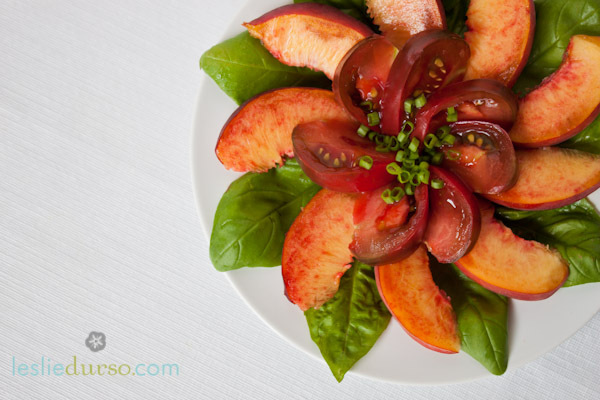 Arrange the peach, tomatoes, basil, and chives on your plate like a flower and drizzle with the vinegar, oil, salt, and pepper. Serve immediately or chilled. You have the prettiest food! I wish I could learn how to make stuff look so outrageously tempting. Hey, this is a sweet site you have here. There’s a lot of new ideas to read here. I also run a website and was hoping you would be interested in trading links with me.